Havasu Home Buyers: Is That Flip a Flop? When the real estate market is hot, everyone tries to cash in. And with shows like HGTV's "Fixer Upper", "Property Brothers", "Home Town", and about half a dozen variations of "Flip or Flop", people think it's really easy to simply buy a fixer-upper, dump some cash into it, and walk away with a huge profit. That's not always the case. While those guys on TV make sure that no corners are cut and everything's up to code, that's not always the case with your everyday "flipper". 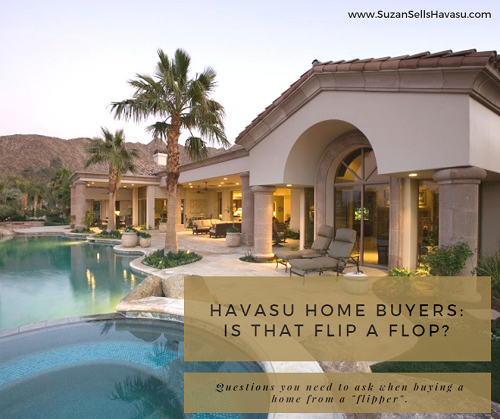 If you're one of those Havasu home buyers who is considering purchasing a flipped home, you might want to ask yourself this first: "is that flip a flop?" Were the Proper Permits Pulled for the Work Performed? This Lake Havasu home was a total gut job. They updated the HVAC system. They tore down walls to create an open floor plan. Maybe they even added an extra bedroom. Havasu home buyers need to make sure all work had the proper permits pulled and approved before signing on the dotted line. Did They Use Licensed and Bonded Contractors? Next, find out who did the actual construction work on the property. Were they licensed, bonded, and insured? If so, then they have to follow specific standards and protocols to ensure the work is done to code. If not, you run a higher risk of shoddy workmanship. Once you get a list of which contractors did what work, check with the licensing board to make sure they have no complaints lodged against them. Another reason you should get a list of all contractors on the job? Just in case there is an issue with something they worked on down the road. You'll know exactly who to call about it. What Did it Look Like Before the Renovations? Many flippers take photos before they do any work, during the remodeling process, and after all the work is complete. Ask to see the "before" photos. These help give Havasu home buyers insight into exactly what has been done to the property. The photos may also reveal things to watch out for as far in the future, such as wiring, plumbing, and ducting. What Other Repairs Have Been Made? Finally, Havsau home buyers should feel free to ask about any other repairs, too. For example, were the windows replaced? If so, do they have a double warranty? This means that the warranty extends to both the original owner (the flipper) and the next owner (potentially, you). If it's a single warranty and you discover a defect after you take ownership of the home, the warranty won't apply. You might also want to ask if there were any small repairs made in the last two or three years (anything costing more than $250, for example). These might not be included on the Residential Seller's Property Disclosure form ("spuds"). However, if you ask about it, the seller must give you an answer. 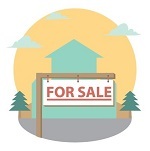 Whether you're a first-time home buyer or a seasoned pro, all Havasu home buyers should ask questions before they plunk their hard-earned cash down on a property. For most people, buying a home is the biggest investment they will make. You want to be as informed a buyer as possible. Contact me if you have any questions about buying a flipped home in the Lake Havasu market.